James Bond 007 lends his teenage nephews the Aston Martin DB5. 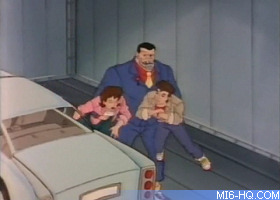 Whilst driving to Warfield Academy, Young Bond is ambushed by S.C.U.M. Lord in his Rolls Royce. S.C.U.M. 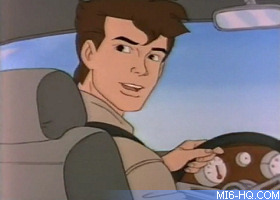 Lord chases Young Bond off a cliff, but Jr manages to escape using the car's flight converter. Little does Young Bond know is that S.C.U.M. Lord wasn't after him, but rather the Aston Martin. S.C.U.M. Lord believes that the car contains a powerful Electromagnetic Pulse Generator (EMP), one powerful enough to destroy every computer within a fifty-mile radius. Everything from the modern toaster to the most sophisticated computer would be rendered useless. With such a device in his hands, S.C.U.M. Lord would be able to destroy all of England's defence and economic computers, thus S.C.U.M. would be able to take control of the UK. Meanwhile, Bond arrives at Warfield for his first day, where he is immediately grounded by Principle Milbanks for being late. While being on Milbank's bad side Bond does become friends with the dorm teacher Mr. Buddy Mitchell, who apparently had met James Bond Senior when he was in the FBI. Later, Bond meets up with classmates Horace Boothroyd the grandson of major Boothroyd (this makes his grandson "IQ") and Gordon 'Gordo' Leiter the son if CIA agent Felix Leiter. Bond also becomes enemies with arch twit Trevor Noseworthy IV. Later on that day, the school receives a phone call from the local pos office - there is a package to Young James from Bond Senior. Knowing it could be important Bond thinks he should pick it up immediately, but needs to find a surreptitious way out as he has been grounded. Fortunately, Milbank's daughter, Tracy tells Bond how to get out undetected - in exchange for a ride in the Aston Martin. As Warfield was once a counter-intelligence training base, several secret passages were built in, and so Bond and Tracy take a secret tunnel all the way down to the beach, where IQ is waiting for them in the Aston Martin. Arriving at the post office, Bond and IQ leave Tracy in the car while they go to receive 007's package. There's just one problem, there is no package from Bond Senior, it was all just a set-up by S.C.U.M. Lord. No sooner than Bond and IQ enter the post office, S.C.U.M. 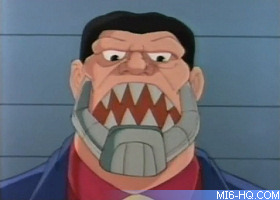 henchman Jaws appears. Bond and IQ run back outside only in time to see Jaws drive off with the DB5, with Tracy in the back of the car... 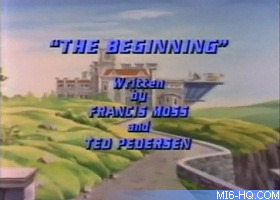 Bond calls Warfield and soon Gordo and Tracy's best friend Phoebe Farragut arrive in the school van. According to IQ, every MI6 vehicle carries a homing signal. 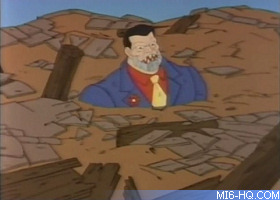 Using a GPS uplink, the team follows the Aston Martin's blip all the way to an abandoned airfield. The car is loaded in the back of a transport truck ready to be transported onto a S.C.U.M. cargo jet bound for S.C.U.M. Lord's lair. 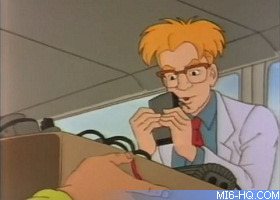 IQ provides Young Bond with his gadget-laden wristwatch, a device that can guide the DB5 by remote, and a tube of super conductive liquid. IQ originally developed the liquid to boil three-minute eggs in ten seconds, but it ended up blowing things up. Sneaking passed the S.C.U.M. minions, Bond puts the liquid in the truck's engine. The engine explodes, creating a distraction. Whilst the goons are occupied by the burning engine, Young Bond sneaks into the back of the truck where he finds Tracy in the Aston Martin's trunk. But before the two can escape, Jaws appears and locks the two in the trunk and drives the Aston Martin onto the plane. The aircraft takes off with Bond and Tracy in the 'first class' section. 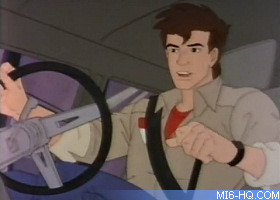 Using the laser in the watch, Bond and Tracy manage to escape. They immediately get behind the wheel of the Aston Martin, and Bond plans to use the flight converter to escape but is unfortunate enough to discover the device had been damaged in the last flight. The noise of the Aston Martin revving up alerted Jaws from the cockpit. Bond fights back against the towering steel-toothed assassin, ramming him and using the car's gadgets against him until finally the henchman is defeated. With no way of getting the Aston Martin off the plane, James Bond Jr plans to destroy the aircraft and everything on it, thus preventing the EMP Generator from falling into the hands of S.C.U.M. Bond uses the remote control to repeatedly ram the DB5 into the cockpit door until, finally, the plane looses control. 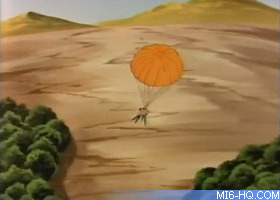 Bond and Tracy jump out on a parachute just as the massive aircraft explodes into the countryside. Having rescued Tracy, Bond quickly returns to Warfield before Trevor Noseworthy can report on him to Mr. Milbanks. 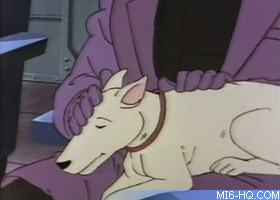 Tracy tells Mr. Mitchell about the rescue, however Mitchell, who had just spoken to James Bond 007, has other news. That EMP Generator that S.C.U.M. was after was never in the Aston Martin at all, as S.C.U.M. Lord had been misinformed. Young Bond feels bad about destroying his Uncle's car, but Bond Senior has other plans. 007 has what is left of the Aston Martin retrieved and shipped back to MI6 in London, there he pays Q to rebuild the car into a new and unique gadget-laden sport scar, the Aston Martin Super. 007 gives the car to his nephew as a gift. The plot to use an EMP Generator to destroy the data of all computers within a 50-mile radius of London was recycled for the 1995 movie 'GoldenEye'. Remote control of Bond's car would be seen again in 'Tomorrow Never Dies'. Jaws, presumably the same character as the movie series, is now quite talkative. In a nod to 'Moonraker', Bond and Tracy escape the plane with just one parachute whilst Jaws breaks his fall in a barnyard. The John Vincent novel adaptation of this episode is called 'A View to a Thrill'. At one point during the fight with Jaws, the Aston Martin is drawn as a four-door sedan rather than a two-door sports car. How did Tracy know Jaws' name? How did James Bond Jr know about the EMP Generator? S.C.U.M. Lord did not reveal his plan. It takes the same amount of time for 007 to retrieve the Aston Martin's remains, have them shipped back to MI6, have Q rebuild the car and deliver the new Aston Martin Super back to Warfield as it does for his nephew to get back to school. The Aston Martin has no licence plate. The DB5's gear shift switches position between shots. Gordo: Whoa! It's an Aston Martin DB5! IQ: But it was flying. Mr. Mitchell: I believe it's the new student, Mr. Milbanks. 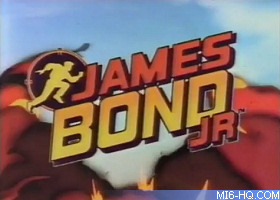 Young Bond: Bond, James Bond Jr.
S.C.U.M. Lord: Goodbye, Young Bond. Jaws: Well, well, Bond, I see you've booked passage on S.C.U.M. airlines. James Bond Jr: Frankly I don't find the stewardess very attractive. 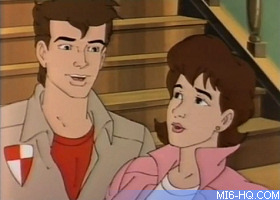 James Bond Jr: Don't worry, Tracy, I'm not that crazy. Jaws: One day I'll get that Bond kid!